I have one of those faces. One of those faces that makes people want to talk. It’s happened more in recent years. I think the knitting facilitates it. It’s an icebreaker, something they can talk about, and often it’s an emotional trigger. There’s the lady who sits next to me in a bookstore and tells me how frightened she was the previous night when her young daughter’s temperature shot up to 104. That conversation started with her asking what I was making. There’s the recovering drug addict who shares his family history, which includes high-ranking players in the South Carolina government. He started out talking about his grandmother, who used to crochet baby blankets. There’s the older gentleman today who tells me about his wife, who passed on a while back. She had diabetes and didn’t control it well, mainly by eating salty junk food and drinking alcohol while her friends were over for cards. That started out with him sharing what a good seamstress his wife was. These people really open up. The bookstore woman talked about her husband and how he just didn’t get it sometimes. The recovering addict talked a lot about his grown son and the worries he had, and all the regrets for bad choices in his life. The older gentleman says with good spirits that “It’s just me and the Lord now.” He keeps busy going to church, and also shooting pool and playing spades. Fortunately, I like listening to these people. One of our knitters brought her father along to knit night and went to do a little grocery shopping. Many other folks in the group continued their conversations, but I got to hear this guy’s story. He was part of the crew for the Tuskeegee Airmen, so it was quite a treat. Some folks say that they meet the most interesting people knitting, but I think they usually mean that they meet other knitters. I often feel like I’m part of the exposition of a detective story. Luckily, it’s a story with a really compelling plot. Do strangers talk to you? Share, won’t you? Protected: Please don’t call child services. January 30th, 2009 admin	Enter your password to view comments. 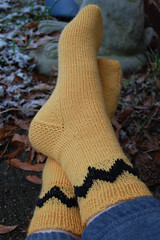 Notes: This was a 64 stitch foot, going to 60 on the leg to make the 10 stitch wide stripe chart work around the ankle. My colorwork on the second sock was better than it was on the first, since I was a little rusty on the two-handed Fair Isle technique. The yarn was very soft, and became even softer after washing. The nice form in the picture at left, by the way, is thanks to the awesome sock blockers that turtlegirl76 sells in her etsy store. Since these were a gift, using the blockers gave them the polished, finished look that I wanted. These were made for my father, whose birthday it is today. It was important to me that these be machine washable since I don’t want my father to have to wash his socks in the sink. It was also important to me that they fit well, since he has some issues with his blood sugar and in that situation, one thing you don’t want to do is cut off circulation to the feet! For that reason, I measured his feet and made them to fit, even if it meant that he knew in advance that he’d be getting socks. He got them at his birthday dinner on Wednesday night and liked how they looked. He put them on later that night (those aren’t his feet at right, they’re mine), and the following day I got a phone call that I’m still giddy about. Apparently they feel “wonderful” (said about ten times) and “fantastic” (about five times) and feel “like butter.” Like most of us, my dad buys his socks by the pack, whatever’s cheapest. I’m not knocking that, I buy my husband’s socks in packs. “I never knew socks could feel like this!” my father said. He sounded flabbergasted. I hope he’s not spoiled for cheap socks now. As for me, I’m feeling like my heart grew about five sizes. 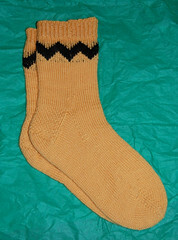 I’ve knitted socks for exactly three people outside myself: my daughter, my mother, and my father. I’m thrilled that he likes them so much. He’s definitely going on the “more socks” list. And now, if you’ll pardon me, I’ll be floating around the house for the rest of the day. The internet is back up, now that we’ve switched providers. The old provider didn’t set up a work order to have the phone line switched, so it took days longer than it should have. You will not be surprised to hear that we were dropping them for being unreliable and unresponsive. Things are still a little sporadic, and I think I’m missing a bunch of mail from earlier this week. Hopefully there weren’t too many order inquiries, but there’s not a whole lot I can do about it. In other computer news, tomorrow I have an appointment at the Mac store to have my MacBook looked at. 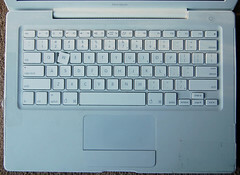 The plastic around the edges of the keyboard part have cracked and peeled off, forcing me to cover the gap with packing tape. Also, the W key has popped off. One of the tiny bits of plastic underneath has broken, so it kind of floats above the space where the key would normally fit. It’s a bit confounding since so many websites start with www. I’m working around this by pushing W, then cutting and pasting that letter, and then simply pasting it where it would normally go. My appointment is for 9am, but the store doesn’t open until 10. I called the store to verify that this was correct and spoke with some guy named Joe. Joe: Yes, that’s correct. If you show up at 9am, there will be a genius here. Me: That’s a bold claim, my friend. Joe: Well, there will be a guy in a shirt that says genius. So tomorrow, hopefully my Lappy will be back on the road to health. Post later with knitting content. Just wanted to post so I could once again breathe the fresh air of the internet. Smells like freedom! 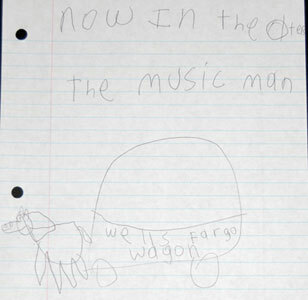 Oho the Wells Fargo Wagon is a comin’! Supposedly today the folks are coming to hook up our new internet connection. This is a problem because, as you can tell by the fact that I’m able to post this this morning, our old internet connection is still active. It was supposed to have been turned off last Monday. Just one more example of how unresponsive our old provider was. We’re not sure they’ll be able to turn on the new one if the old one is still working. I guess we’ll see. In the meantime, I’ll be sticking around the house, just in case. I have no clue when the internet may be up or down, so bear with me if I disappear for a while for no apparent reason. At right: I wish! I would totally go see that, and I would bring my family, and we would buy popcorn and have a fantastic time. She drew this yesterday morning, and in the evening she opened up our big CD binder labeled “movies.” “I just want to look at them, not to watch them,” she said. Then she flipped through them all, stopping at one page and saying, “The Music Man is in here.” “You can watch that one,” Mr. Tvini said. Quick as lightning, she had it out of the binder and into the DVD player and was singing along. You can’t go wrong with The Music Man. I’m hoping the Wells Fargo wagon is bringing me some new internet today. Em’s still clinging to Christmas. According to her, she’s going to find a fir cone, get a fir seed, and grow a Christmas tree. 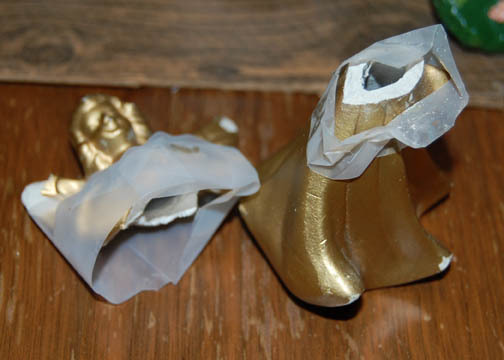 Today I was putting away the manger scene and found the angel tucked away in the back. That’s Scotch tape around her midsection there. At least there wasn’t glue involved. But no pressure. You’re killing me, kid. I have been paranoid all week that something terrible is going to happen, that some nut job is going to sneak in in spite of the incredible security and try to take a shot. As of now, I’m letting it go. I normally have a great deal of faith in my fellow human beings, and that attitude has served me well for 39 years. I’m going to believe that this will be the moment of triumph that it rightfully should be. 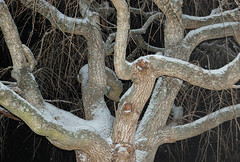 After all, it snowed today, and that’s got to be a good sign. Woman’s puppy chews inauguration ticket. Damned cockapooblicans! Darrin Bell of Candorville has a nice inauguration cartoon. I think I should recognize more faces than I do. Too bad we spent all our gold in the process. Last night I dreamed that when I got up, I had to check on school closings because it had snowed during the night. They weren’t closed, because there was very little snow. It was disappointing. At 5am, in the middle of this dream, I woke because my husband had gotten up. He walked to the window, looked out, and said, “it snowed.” I leapt out of bed and ran to the window, and said, “it’s snowing!” Then I checked the computer, and whaddya know, school is cancelled. It’s going to be a fantastic day! We’re switching ISPs here at home. The switch is supposed to happen tomorrow, but in the way of such things, I am not expecting it to be seamless. If I’m out of contact for a while, that’s what’s happening. In the absence of actual content, how about a link? The comments on the Playmobil Security Checkpoint are priceless.